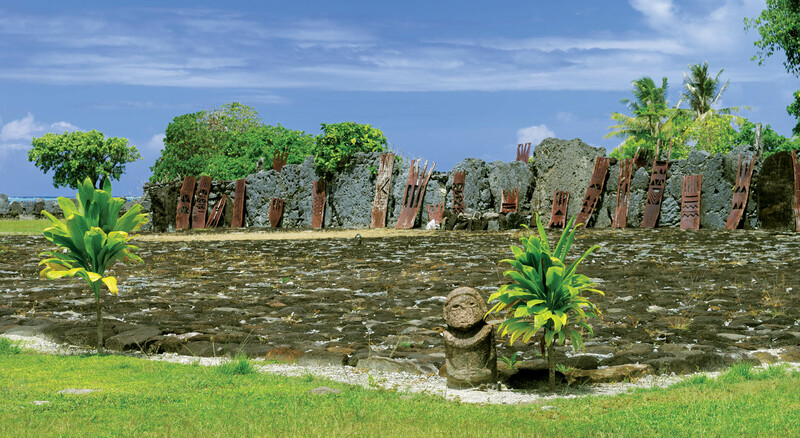 Outside of Tahiti and her islands, the “marae” arouse as much interest and interrogation as the mysterious “Moai” of Easter Island. In many respects, the marae are part of the great enigmas of the South Pacific. The marae were places of sacred worship and open-air temples of ancient pagan rituals. Today, the “marae” fascinate, attract and at the same time, get us a bit worried and confused… Probably because we do not really know what was being done there… Neither do we know which powers -either good or dark- the marae were serving… In reality, the “marae” are confusing because they are somewhat “hermetic”, in a sense that they give little clue to the uninitiated observer and “keep their secrets” … Yet, the “marae” do deliver a strong message. When you walk on their floor, tiled with old stones, you can feel some presence there, you can feel acting forces around you, along with some mysterious energies fluttering in the air… But, a good part of the message of the “marae” remains encrypted … No doubt that it is by ignorance that the Western imaginary tends to classify the “marae” in what would be more inherent to esotericism than to the culture of a people … That of course is a mistake but it is difficult to avoid it. Indeed, the typical Western approach to knowledge of foreign peoples’ history and culture always requires a written tradition to be able to proceed according to its own criteria and really achieve results. But such approach tends to wander somewhat and even fail in situations where history and archeology do not offer any written traces and only few clues… Therefore, only the Polynesian oral tradition can tell us more about the “marae” … What does it tell us? In fact, the marae were places of worship which symbolic perimeter was that of an open-air building that was generally built away from the places where people were meeting and interacting. Most of the “marae” have a rectangular shape and are paved with stone or coral (in some islands where stones are absent or scarce). They are often delimited by a stone enclosure wall, along which were formerly planted trees such as banyan, aito (coniferous providing hardwood), rosewood or tamanu. These species of trees were said to be endowed with the power to ward off evil spirits … Some “marae” feature an altar and reveal vestiges of buildings such as the former “fare tapupa’u” (where the bodies of deceased received the funeral rites) and the “fare tahu’a” which was the priest’s house. Moreover, the word “marae” itself evokes a bare and open space. But it has a second meaning related to the old social vocation of the marae: The term “marae” also refers to a space dedicated to meetings, leaders’ intronizations, ritual ceremonies, marriages, offerings to the gods, sacrifices … The marae were the places of all the rituals and ceremonies in which an appeal was to be made to the gods with view of obtaining either their protection, or their guidance, or their forgiveness.